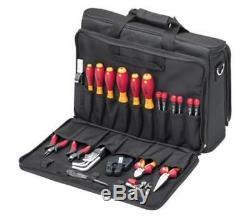 The 29-piece Wiha service technician's tool set is suitable for all electrical and electronics maintenance work. The combined laptop bag/tool bag has separate compartments for hand tools, a laptop, and documents. There is sufficient space for additional individual equipment. The tool side bag can be completely laid open or removed to be used separately thanks to the zip fastening. The laptop bag is suitable for all common laptops. VDE insulated tools, each one tested to 1000 V. 1 x Voltage tester SoftFinish single-pole, 110-250 V, slotted: 3, visible blade length: 60 mm. 1 x Screwdriver SoftFinish electric slimFix, slotted: 3.5, visible blade length: 100 mm. 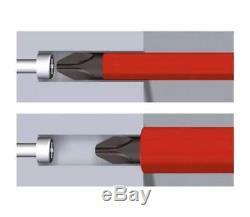 1 x Screwdriver SoftFinish electric slimFix, slotted: 5.5, visible blade length: 125 mm. 1 x Screwdriver SoftFinish electric slimFix, Phillips: PH1, visible blade length: 80 mm. 1 x Screwdriver SoftFinish electric slimFix, Phillips: PH2, visible blade length: 100 mm. 1 x Screwdriver SoftFinish electric slimFix, Pozidriv: PZ1, visible blade length: 80 mm. 1 x Screwdriver SoftFinish electric slimFix, Pozidriv: PZ2, visible blade length: 100 mm. 1 x Fine screwdriver PicoFinish, slotted: 1.5, visible blade length: 40 mm. 1 x Fine screwdriver PicoFinish, slotted: 2.0, visible blade length: 40 mm. 1 x Fine screwdriver PicoFinish, slotted: 2.5, visible blade length: 50 mm. 1 x Fine screwdriver PicoFinish, slotted: 3, visible blade length: 50 mm. 1 x Fine screwdriver PicoFinish, Phillips: PH00, visible blade length: 40 mm. 1 x Fine screwdriver PicoFinish, Phillips: PH0, visible blade length: 50 mm. 1 x Switch cabinet key cross shape, square nut: 5-8, triangular nut: 9. 1 x L-key set in a Compact holder, 9 pieces. 47 x 35 x 22 cm (L x W x H). 1 x Diagonal cutters Professional electric with DynamicJoint, pliers length. 1 x Diagonal cutters Electronic, pliers length. 1 x Stripping tool, pliers length. 1 x Stripping tool automatic, pliers length. 1 x Needle nose pliers Professional electric, pliers length. 1 x Needle nose pliers Electronic, pliers length. We go above and beyond to ensure you receive the best level of service. The item "Wiha 29 Piece Electrical Technician's Tool Set In Combined Laptop/Tool Bag" is in sale since Thursday, October 11, 2018. 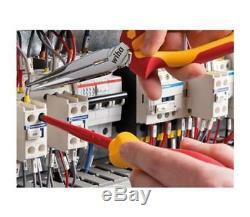 This item is in the category "Business, Office & Industrial\Hand Tools\Screwdrivers". The seller is "hifly8002013" and is located in Derby. This item can be shipped to United Kingdom, Austria, Belgium, Bulgaria, Croatia, Cyprus, Czech republic, Denmark, Estonia, Finland, France, Germany, Greece, Hungary, Ireland, Italy, Latvia, Lithuania, Luxembourg, Malta, Netherlands, Poland, Portugal, Romania, Slovakia, Slovenia, Spain, Sweden, Australia, United States, Canada, Japan, New Zealand, China, Israel, Hong Kong, Norway, Indonesia, Malaysia, Mexico, Singapore, South Korea, Switzerland, Taiwan, Thailand, Bangladesh, Bermuda, Bolivia, Barbados, Brunei darussalam, Cayman islands, Ecuador, Egypt, Guernsey, Gibraltar, Guadeloupe, French guiana, Iceland, Jersey, Jordan, Cambodia, Liechtenstein, Sri lanka, Macao, Monaco, Maldives, Martinique, Nicaragua, Oman, Pakistan, Peru, Paraguay, Reunion, Saudi arabia, South africa, United arab emirates, Ukraine, Chile.